We are ocean’s gay flowers. AlgAran. "Situated in Southwest Donegal, all AlgAran seaweed is organically hand harvested locally with maximum respect/care for the marine environment." Bláth na Mara. Seaweed from the Aran Islands. 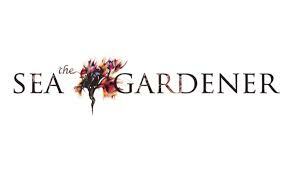 "We specialize in harvesting wild red and brown species growing on our Atlantic shores. Certified organic, we service the Food & Beverage and Cosmetic industry as well as partnering with R&D institutes. All of our products are traceable back to the time and place where it was picked from. Our testing regime ensures the supply of a high quality product. Sustainable harvesting methods and respecting the environment are at the core of Bláth na Mara’s values." Connemara Organic Seaweed Company. "Our mission is to provide hand harvested, sustainable, kelp and seaweed products for human consumption through health supplements and edible products. Having a positive impact on our community and our environment is at the core of all that we do." Emerald Isle Organic Irish Seaweed. "A family business producing seaweed as supplements, cooking, gardening and bath products." Irish Seaweeds. "Irish Seaweeds products are 100% seaweed or vegetable based, including their seaweed soaps and are thereforesuitable for vegetarians. All seaweed is hand-collected in the north of Ireland at pristine sites." The Seaweed Gardner. "If you are interested in seaweed cookery, foraging, health benefits, garden and beauty uses, there is something here for you. We have been running seaweed workshops along the Co. Waterford coast since 2008 and are now sharing the knowledge through a range of workshops and cookery demonstrations and a new book – The Sea Garden." This is Seaweed. "After many years researching the marine environment and delighting in the foods that it produces, I thought it was time to share what I’ve learned about the culinary journey from shore to kitchen." Wild Irish Seaweed. "Wild Irish Seaweed, sustainably hand harvested by The Talty Family off the coast of Co. Clare. All our seaweeds are 100% Wild, Natural and certified Organic. Fourth generation seaweed harvesters, Wild Irish Seaweeds cater for the retail and wholesale markets." Rí na Mara. "... harness the power of the sea and the natural environment to promote healthy, beautiful skin. This unique range of beauty products is made in Ireland with Irish-sourced ingredients. SeaVite. "In the 1980s, Patrick Mulrooney, began his quest to cure his daughters’ severe eczema. Through combining pure botanicals and nutrient-rich Irish seaweed extracts, he formulated the Seavite range." Voya. "A voyage of discovery and innovation: the global business that is VOYA started out as the family-run seaweed baths established by Neil Walton near his home in Strandhill, County Sligo on the wild Atlantic coast of Ireland." Ocean Harvest Ireland has created a variety of seaweed based formulas centred on the bioactive ingredients present in different seaweeds. These ingredients allow their feeds to replace many of the synthetic components found in a diversity of other agricultural and aquacultural feed ingredients. Seaweed for Dogs. Unique blends of seaweed especially for dogs. AlgAran. Situated in Southwest Donegal, all AlgAran seaweed is organically hand harvested locally with maximum respect/care for the marine environment. Arramara Teo. "Founded in 1947 to utilise the large resource of seaweed available on the West Coast of Ireland. This area has many sheltered bays and inlets, where the risk of pollution is very low due to the absence of heavy industry, intensive farming, or busy shipping lanes." Brandon Products. "Brandon Bioscience has been helping growers increase the yield potential of their crops since its foundation. Thousands of farmers in more than 36 countries worldwide choose our Ascophyllum nodosum extracts to unleash the yield potential of their crops." Sea Nymph. "We offer our customers over 20 different Liquid Formulations, four different grades of Granular Seaweed Meals, Wetting Agents, Spray Indicator Dyes, Non Seaweed Foliar Feeds and a new Marine Organic Compost designed as a Nematode and Fungal Suppressant." 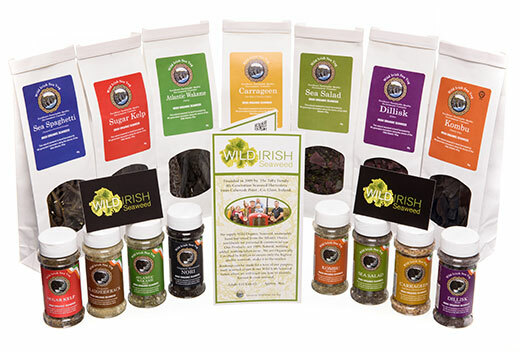 Wild Atlantic Seagarden is a multivendor marketplace promoting innovative Irish seaweed-based products. CyberColloids Ltd. CyberColloids, based in Cork, is an independent, business driven, research (technical and market) and product development group specialising in hydrocolloids, focusing on food, nutrition and industrial applications. Site © M.D. Guiry 2000 - 2019. Important copyright notice: all text, design and photographs on this site are copyrighted by M.D. Guiry unless otherwise stated and all rights are strictly reserved. Click here for copyright information and contact. Website design: 249 Design Studio. Site maintained by M.D. Guiry (michael.guiry@nuigalway.ie). There have been 8709376 page loads since 1 January 2014 on 19 April 2019.